Vodun’s music combines a really diverse variety of influences, and your work with previous bands like Do Me Bad Things and Chrome Hoof is even more genre-bending. What would you consider to be your most important musical influences, and how did you discover them? There are so many different genres that I’m influenced by it makes choosing a most influential artist/band a hard task indeed. However, several strong influences for me were Earth, Wind & Fire, Queens Of The Stone Age, Aretha Franklin and Chrome Hoof. Earth, Wind and Fire are one of those bands who have always been around as they’re known for their disco hits, so I randomly decided one day to buy a best of album. One of the songs on that album was ‘Fantasy’, which just blew me away. Actually made me feel like I was flying through space to find an enchanted land. Their uplifting horn arrangements, and the fact that their backing singers were ‘The Emotions’, cemented my love for them. I discovered QOTSA whilst in DMBT, on tour I think. We had ‘Rated R’ on a steady rotation. When they came out with ‘No One Knows’, I immediately went out and brought ‘Songs For The Deaf’ and wouldn’t stop listening to it. They were actually responsible for starting me on the road to listening to heavier music. Josh Homme’s fantastic falsetto and vocal melodies over big riffs is executed so very well. The influence that Aretha’s had on me as a soul singer is just amazing. Again, she’s an artist who’s always been around, but I never knew what a talent she was until I started to sing her songs and realised the vocal complexities and beautiful subtleties of her delivery. It was in my mid 20’s that I really started to listen to her. I didn’t know where to start with her as she has such a body of work, so I picked up a random compilation and spent weeks listening, learning and trying to figure out how she managed to sing in her upper register with such ease. With Chrome Hoof, I had discovered them several years ago at a beautiful and small festival called ‘Tapestry’. They were the perfect mix of electro, funk, classical and heavy rock – everything I liked about music. Their performances reminded me of a P.Funk party set in a Pagan Spaceship. So I asked if I could join. The number of different artists I’ve now come to know because of the members of that band is stunning. According to your website, you’ve worked with a wide variety of artists, both within and beyond the rock/metal scene. Do you have a favourite style of vocals or genre to work with? I think any genre that allows me to fully express myself dynamically is great. Going from zero to a hundred within a song is where I live, and whatever allows me to paint a picture of a strong emotional state is a joy to sing over. Vodun was founded in 2012 – what is the story of the genesis of the band? The roots and origins of VODUN trace back to an old band called ‘INVASION’, which was where Zel and I met. With the demise of ‘INVASION’, VODUN was born. Finding spirits that seemed to fit perfectly with the presentations of ourselves; Zel embodying the spirit Ogun, who is a warrior & forged in fire – and myself, finding a fit with Oya, as the spirit of change. We were already writing totemistic and animistic songs, with eclectic elements of heavy bluesy rock, soul, afro-beat & psych, so it just seemed to fit. How has the sound and song writing of the band developed between your first EP, Eat Up the Sun, and the new album, Possession? The EP was our very first exploration into ourselves as a unit and at trying to create songs that were dynamically cohesive. I think the new album has a much stronger theme musically and lyrically. Our sound and direction has been somewhat more solidified, incorporating more Afro-rhythms and percussion, and having more of a vision of what we wanted the album to be. Many listeners might not realise that the name Vodun is another form of a more familiar word, Voodoo. 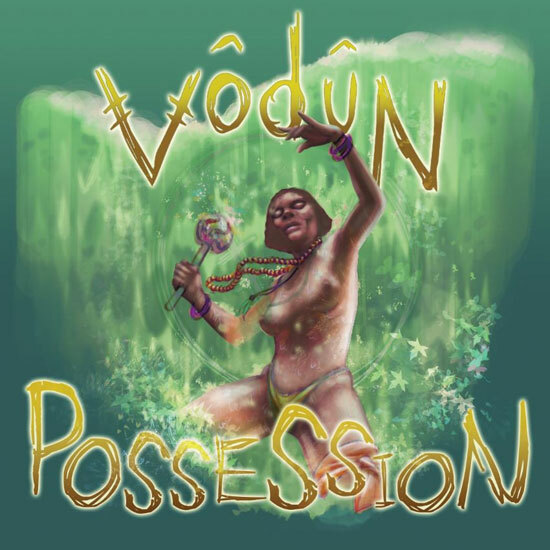 As an album, the influence of Vodun on Possession is very clear, and your label describes the concept behind Possession as revolving ‘around West African tradition and religion of Vodun with themes of spiritual possession, slavery and colonialism.’ These should all be familiar ideas to most of us, but the concept of ‘Voodoo’ has been totally appropriated, and as far as I can gather, bastardised, by Western media. What is the significance of Voodoo/Vodun to you, and why did you decide to make it such a prominent theme in this particular project? West African Vodun is a religion that managed to hold on to its people in different forms and lands even through slavery, and is still practiced by descendants in its various forms all over the globe. It’s an amazingly interesting part of my ancestry, and being one of the first religions of my ancestors, it has a place with me. As I touched on before, the spiritual side of connecting with nature, but with the added aspect of female loas were also very appealing to us. We felt like those traits have much to offer our modern world and its destructive enthrallment with capitalist, disposable consumerism. The imagery you use to promote is also clearly influenced by the idea of Voodoo/Vodun – for example, your promo photos, and gigs advertised as ‘live rituals’, (and whilst I haven’t yet experienced one, from what I gather they live up to the title! ), and your website names all three members using stage names (Oya, Marassa and Ogoun). It’s clearly something that’s been considered and thought through; were there any specific influences on this style and presentation of the band? The influence has been the vodun itself and the phenomenon of possession. It’s similar to what we hope to achieve in our live shows – personal defences down, sweat, convulsions and giving yourself over to the music and something else. The concept of possession is about giving yourself over, surrendering to the spirits, but also finding strength and transforming yourself into a goddess /god, which is why we’ve chosen to represent those specific spirits. Visually, we try to convey our take on what we see Oya, Ogoun & Marrasa to be. The world of rock and metal has a reputation for being predominantly both white and male. As both a woman, and a member of an ethnic community, have you experienced any prejudice first hand? How does this compare to working within other scenes/genres? I’ve generally been fortunate enough to not have experienced any outright prejudice due to my ethnicity, however I think scepticism gets pointed in my direction more than anything. But then I open my mouth, and some who perhaps were sceptical, find that they actually like the marriage of the sounds. Also, with myself and the drummer being female, we sometimes find that people assume we are ‘groupies’ and not actually members of the band. I think that issue goes across scenes/genres sometimes due to the perception of the female musician, but perhaps a little more often in the world of rock as opposed to, say, soul. Possession is gearing up for release this month, and you guys have a tour booked in April. Beyond that point, what might the future look like for Vodun? 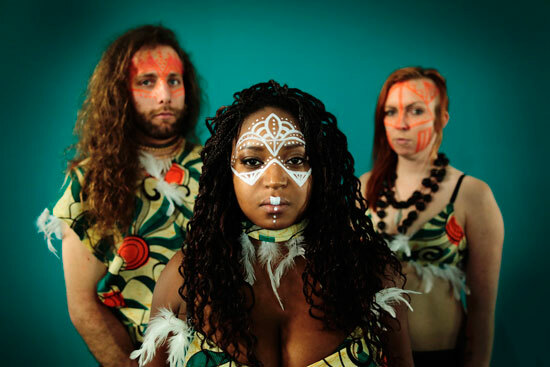 The future for VODUN has an exciting year of writing for the next album, and more ventures across the UK and into Europe. We also aim to continue to explore Vodun, and to push our musical boundaries with various genres whilst keeping a cohesive and interesting sound. Eclecticism is a way of life, so let it be your aim.